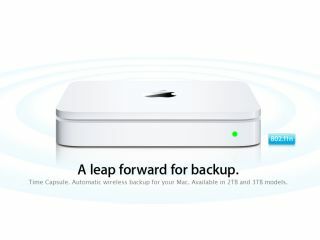 Apple has snuck a new 3TB Time Capsule back-up device on to its online US website. Although the new Time Capsule isn't available to buy yet, it seems that the 1TB model is being retired and replaced with the larger 3TB version, while the 2TB version remains. No word yet on how much the big fat storage unit will set you back; in fact, no sign of the 3TB model on the UK Apple Store yet at all but we're sure Apple won't leave us Brits behind for long. Hey, we've thought of something you can store in your humungous 3TB Time Capsule – massive videos put together using Final Cut Pro X. That's us tenuously segueing into the news that the popular video editing software has just hit the Mac App Store with a UK price of £179.99. Alongside Final Cut Pro X, Apple has launched two companion apps for videographers; Compressor for advanced media encoding and Motion 5 for moving graphics.